Last year it was announced that a new subsidiary company had joined the HAVER family: NEWTEC BAG PALLETIZING, a company employing 70 workers, based in the Alsatian city of Illzach, France. NEWTEC BAG PALLETIZING supplements and enriches HAVER’s famous product range with palletizing machines. HAVER & BOECKER offered the security of a family and the new subsidiary company brought 40 years of experience in the sector of palletizing systems. During this period NEWTEC BAG PALLETIZING had made a name for itself in the chemical, fertilizer, cement, limestone, gypsum, and building products industries, and is proud to look back at more than 1,600 systems delivered. 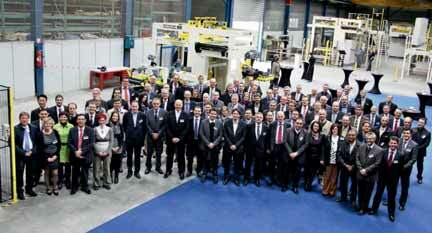 About one year ago the French subsidiary company joined the parent company into known and new customer sectors. As a complete systems supplier in the packing industry, it did not take long for this development to lead to success: NEWTEC BAG PALLETIZING has increased its turnover already by a third, and a doubling is planned within the next five years. Here the new subsidiary company benefits from the global sales network of its parent company. Support from the other HAVER family companies is also certain for NEWTEC BAG PALLETIZING. Mutual developments are planned for the future so that even more efficient systems may be offered to customers. The first step was achieved with the development of the new Palletizer Series 5000, which will be used mainly in the building materials industry and matched to the speed of HAVER’s packing machines.